The Lit & Phil, lunchtime, jazz, a large turn out, what's new? 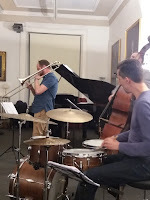 Leeds College of Music Senior Lecturer Kevin Holbrough made the short journey to Tyneside to play a lunchtime gig with the Paul Edis Trio. For this one-off occasion, the concert was billed as the Kevin Holbrough Quartet. John Lewis' Afternoon in Paris* eased the Lit & Phil's audience into the one hour set. Trombonist Holbrough had worked as a dep in Edis' ace sextet but this was, likely as not, his first encounter with bassist Andy Champion and drummer Russ Morgan. First impressions? He couldn't have been other than impressed! Cole Porter's I Love You featured a superb solo by Andy Champion...nothing new there! 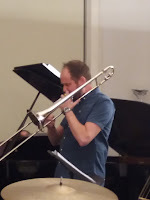 In a Sentimental Mood showed what Holbrough could do with the ballad form and in a change of tack, Tom Harrell's April Mist illustrated the Lit & Phil's guest was at home across a breadth of material - GASbook to the more contemporary. All the Things You Are is in many a set list and here in Newcastle Holbrough had it in his. Fans of straight-ahead jazz were in their element and a return engagement by Holbrough would surely go down well. Sixty minutes of jazz once a month at the Lit & Phil invariably fly by and there was just time to fit in a brace of tunes by one of Holbrough's heroes. The lecturer and gigging musician spoke of the moment he knew he wanted to play jazz. Playing in South Yorkshire colliery bands he returned home one day and, for the first time, listened to JJ Johnson. That was it, and, as they say, the rest is history. First, Lament followed by In Walked Horace. It had been an excellent afternoon of jazz. More photos from Brian Ebbatson. * Check out Lewis' album Afternoon in Paris with saxophonist Barney Wilen and a rather good jazz guitarist...Monsieur Sacha Distel.